Which Retailers Offer Same-Day Delivery (Besides Amazon)? You don't always need a Prime membership to get this service. Walmart, Target, CVS, and other national chains are expanding their delivery options. Whether you're too busy to shop or too sick to get out of bed, same-day delivery can be a lifesaver. Still, you can expect to pay extra for the convenience. We've rounded up 15 retailers and app-based courier services offering same-day delivery in the U.S. as of June 2018. Our list gives you an idea of the prices you'll pay for this service, as well as the regions where it's offered. Amazon, which last year purchased Whole Foods for more than $13 billion, is also now offering Prime members free 2-hour deliveries from the grocery chain on orders over $35. Right now, this service is only available in 14 cities — including Austin, Cincinnati, Dallas, Denver, Virginia Beach, Atlanta, Sacramento, San Francisco, Baltimore, Boston, Philadelphia, and Richmond — but the company has been quickly expanding the service and plans to continue bringing it to more cities throughout 2018. In 14 cities, Whole Foods offers free 2-hour delivery to Prime members on orders over $35. If two hours is too long to wait, you can pay $7.99 to have your groceries within an hour. Deliveries from Whole Foods through Prime Now are available daily from 8 am to 10 pm To see if you're in the delivery area, visit the website or download the Prime Now app and enter your ZIP code. Don't have time to run out to the store? In a growing number of cities, you can shop online and Walmart will deliver your groceries the same day. 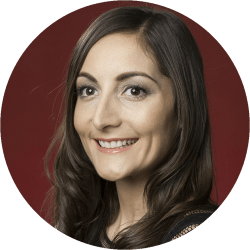 The service is currently available in select markets, including Denver, Dallas, Phoenix, Orlando, Tampa, San Jose, the metro Atlanta area, and Charlotte. Walmart plans to expand this service to more than 100 metro areas across the country by the end of the year, with the help of crowdsourced delivery service partners like DoorDash, Postmates, and Deliv. Walmart charges $9.95 for deliveries and requires orders to be at least $30. Target offers same-day deliveries of groceries and home essentials in 34 states. You can order via Target's Shipt app or website, schedule your delivery, and the order will arrive in as little as one hour. To take advantage of this service, you'll need a Shipt membership, which costs $99 a year or $14 a month. Delivery is free for members on orders over $35, or you can pay a $7 fee on smaller orders. To see if this service is available in your area, go here and enter your ZIP code. In February, the Walmart-owned warehouse club inked a deal with Instacart (more on them below) to offer same-day grocery deliveries in Austin, Dallas-Fort Worth, and St. Louis, with plans to expand the service to "millions of additional households across the U.S throughout 2018, and beyond." Instacart Express members get shipments free. Otherwise, it costs $5.99 for same-day deliveries on orders of at least $35 or $7.99 to get your package within the hour. To see if it's available in your area and shop, check out the Sam's Club website. A big player in the grocery delivery space, Instacart offers same-day delivery from places like Whole Foods, Costco, BJ's Wholesale Club, Petco, and Publix in many cities across the country. The company says "the delivery fee depends on the size of your order and the delivery time that you choose," but expect to pay $5.99 for 2-hour deliveries and $7.99 for 1-hour deliveries, or more during exceptionally busy times. Watch the prices on Instacart, as you might wind up paying 40 cents to 50 cents more per item there. With Instacart Express, delivery is free on all orders over $35. New customers can get a 14-day free trial of Instacart Express. After that trial, you'll pay $149 annually for the service. Just watch the prices on Instacart, because at least one blogger warns that you might wind up paying 40 cents to 50 cents more per item there. To see if Instacart is available in your area, click here. Another courier service, Postmates delivers food, drinks, groceries, and even alcohol from local restaurants, retail shops, and grocers. It's currently available in areas such as San Francisco, Sacramento, Los Angeles, Long Beach, Orange County, and San Diego, CA; New York City; Chicago; Miami; Washington, D.C.; Phoenix; Seattle; Atlanta; Las Vegas; Portland, OR; Charlotte; Nashville; Denver; and Oklahoma City. The Postmates website will tell you if delivery is available in your area. Expect to pay $3.99 to $5.99 in delivery fees (plus $1.99 extra if your order is less than $12). Or sign up for a Postmates Unlimited subscription ($9.99 monthly or $83.88 annually) for free delivery on all orders over $20 and no surge pricing. On its website, Verizon states it offers same-day deliveries in Manhattan. 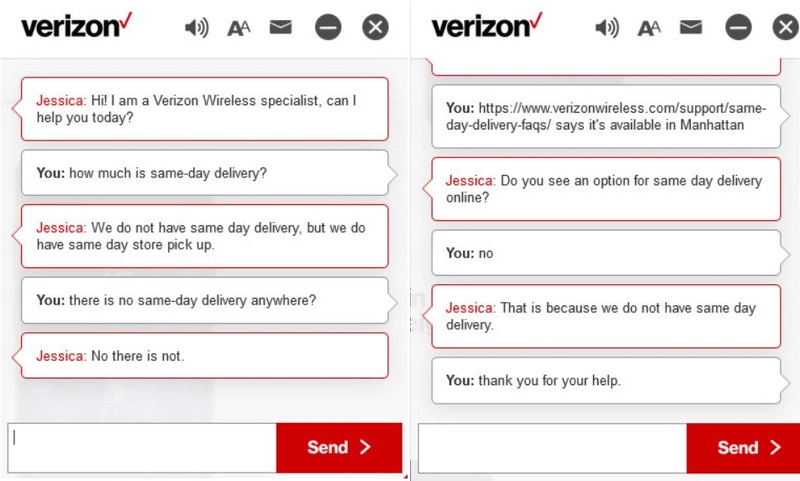 But when we chatted with a Verizon Wireless specialist online, we were told same-day delivery is not currently available anywhere (see below photos). Note: Verizon's website says customers in Manhattan can order before 1 pm to get their device delivered before 4 pm that day, or order before 5 pm to have it delivered by 8 pm. Just shop online, then choose the same-day delivery option at checkout, if you see it there. Keep in mind that you'll need to be there to sign for the device. Verizon says "new devices may not be eligible for Same Day Delivery due to potential inventory constraints." Need your prescription fast, but can't make it to the pharmacy? CVS is now offering same-day prescription deliveries in New York City, Boston, Miami, Philadelphia, San Francisco, and Washington, D.C. Orders must be placed by 4 pm local time, and you'll pay an extra $8.99 for this service. More information about CVS Pharmacy delivery options is featured here. Need a new computer — like now? In select areas and ZIP codes, you can order on BestBuy.com before 3 pm local time (or 2 pm on Sundays) and have your product delivered the same day at a cost. Just select the same-day delivery option at checkout. Prices vary, but expect to pay around $5.99 extra if you want a new laptop delivered the same day. To see if Best Buy same-day delivery is available in your area, head here. The office supply store offers same-day delivery on "qualifying items" in 30 cities, plus Washington, D.C. You'll need to place your order by 2 pm and select a 3-hour delivery window when you'll be available to sign for the package. On orders up to $34.99, you'll pay an extra $15 for same-day delivery. On orders of $35 to $74.99, you'll pay an extra $7.50. And on orders of at least $75, same-day delivery is free! To see if Office Depot & OfficeMax same-day delivery is available in your area, check out this list. At this point, Staples is only offering same-day deliveries in Boston, Dallas, Chicago, and New York, but the company plans to "soon" expand this service to Houston, San Francisco, Los Angeles, and Seattle. The office supply store charges $9.99 for same-day delivery of orders over $49.99. Just order by 3 pm local time. To see if Staples same-day delivery is available in your area, head here. Staples charges $9.99 for same-day delivery of orders over $49.99, but you need to place your order by 3 pm local time. Macy's offers same-day deliveries with the help of Deliv in select cities. You'll have to order by 1 pm local time Monday through Saturday, or by 11 am on Sundays. You'll pay an additional $8 for this service on orders of at least $99. Visit the Macy's website to see if it's available in your area. Order by 2 pm in the recipient's time zone to get same-day flower delivery, available in "most areas of the United States and Canada," according to FTD. If ordering on a Saturday or Sunday, you must place it by 1 pm in the recipient's time zone. To order, click here. Having a chocolate craving or looking to get on someone's good side? For $20, you can have items delivered from a local Godiva shop within a 15-mile radius the same day. Just place your order by 1 pm local time for delivery on the same day. Find your local shop with the Godiva directory. Now that we've talked about everyone else, it's still worth mentioning Amazon. The megaretailer offers Prime members in more than 8,000 cities and towns "delivery as fast as today" on more than a million items. Just choose the same-day delivery option at checkout, and be sure to place your order before noon to receive your items by 9 pm. If you're not a Prime member or your order is less than $35, you can still use the Amazon same-day delivery service for eligible items. However, it'll cost you up to $5.99 per item for Prime customers with orders less than $35, and up to $9.98 per item for non-Prime customers. Prime costs $119 a year or $12.99 a month. To see if Amazon same-day delivery is available in your area and shop eligible items, head here. 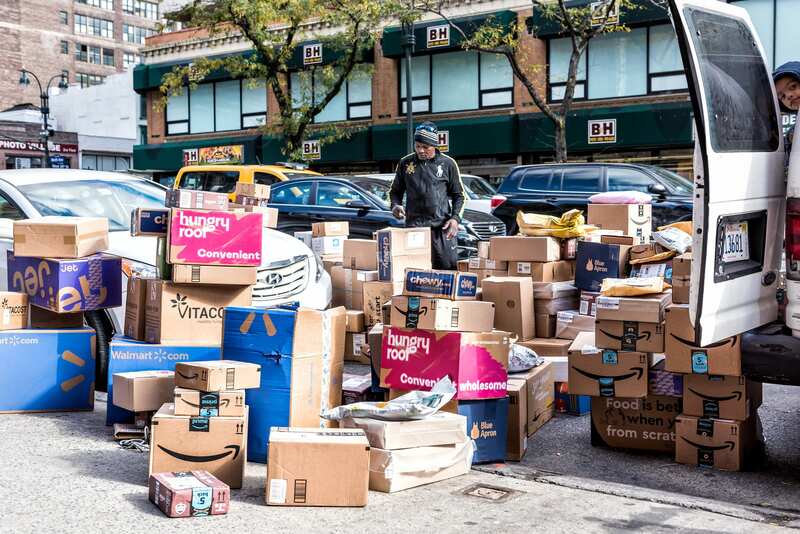 With Prime Now, Amazon offers 2-hour delivery on "tens of thousands of items," including household essentials, groceries, electronics, gifts, and seasonal products. Amazon's Prime Now couriers will also deliver food to your home, office, or apartment from local restaurants in Manhattan, Brooklyn, Seattle, Dallas, San Francisco, Oakland, Los Angeles and Orange County, Chicago, San Diego, Austin, Atlanta, Houston, Miami, Baltimore, Minneapolis, Tampa, Orlando, Northern Virginia, Washington, D.C., Phoenix, Columbus, Las Vegas, and Portland, OR. Click here to see if Prime Now is available in your area. Readers, what same-day delivery services have you used? Did we miss any retailers that offer same-day delivery? Let us know in the comments below!